Benton Harbor friends, family, and statewide activists are VERY concerned about the many correctional facility moves that Rev. Pinkney has experienced lately. In the last month, he's been moved to at least six different prisons--that we know of! Last Tuesday, 11/25/08, he was moved to Jackson. On Monday, 12/1/08, he called his wife to tell her he was being moved to Muskegon. Today we learned he is in Kingsley, Michigan, at Pugsley Correctional Facility. Just because you move a 'truth speaker' doesn't mean you'll stop the truth! Then again, it does make it easier for this courageous leader to share his story and build up the people's army on the government's dime. Continue signing the online petition to free Rev. 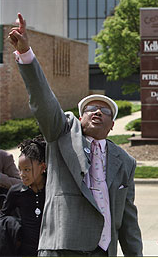 Pinkney, and send your letter requesting clemency to Gov. Granholm.